To drive this bot we will be using a control glove which acts as a gesture sensor. The gesture sensor will have an accelerometer and a flex sensor to control the status and the direction it should move. The flex sensor activates the Spinel Crux and the tilt of the accelerator determines the direction it should move. And yes, there is a robot building kit available for you to build one yourself. In this video series, we will explain everything about this gesture control robot, controlling it with the hand gesture using the gesture sensor control glove and will show you how to make one yourself. We build a control glove to control the Robot using hand gestures which will act as a gesture sensor. 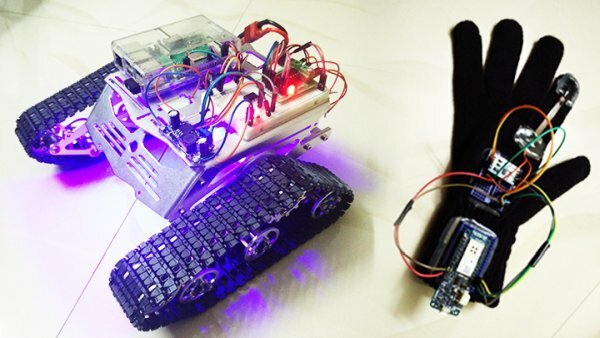 We use Raspberry Pi and Arduino to create our Gesture Controlled Robot. Arduino to make the control glove, which will detect the hand gestures and send the data to Spinel Crux via WiFi.